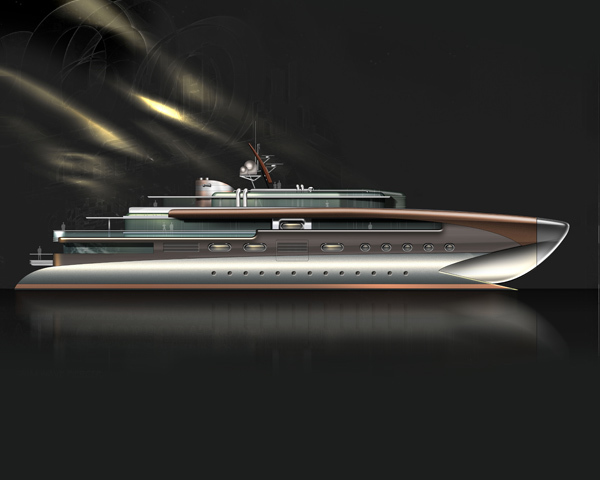 74 metres LOA with a 26-metre beam, the project offers accommodation space exceeding that of most 100 metres-plus yachts. Based on an existing tried and proven commercial platform, offering excellent performance, range and sea keeping. The flexibility afforded by this platform has led to the development of a number of accommodation options. A massive owner’s suite at bridge deck level that includes cabin, private saloon, office and library. All guest accommodation would be developed at upper deck level, including saloons, dining room, library and four VIP staterooms, plus a further four cabins for guests and staff on the main aft deck. The crew and service accommodation would be within the high volume demi-hulls. 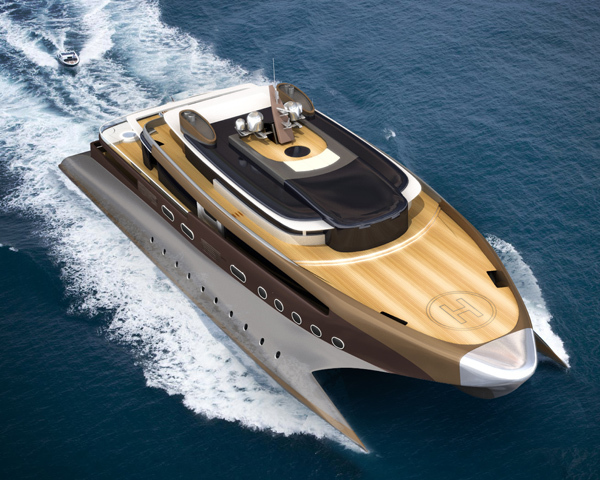 Fast 12-metre Pascoe tenders and limousines will be launched via beam cranes from the forward bay. Giant platforms aft are designed to rise and fall to ensure that guests can enjoy a variety of experiences, from the platform that lowers to below waterline level to provide a safe beach and paddling pool, to dining just above sea level with views forward and aft and a high-level panoramic terrace. Another central access point to the sea is created at the aft end of the wave piercing bulge—again, a solution only possible on this type of hull form. Another first is the double-height, all-glass swimming pool spanning two decks, which besides providing a unique guest experience also enhances vertical integration. All the bulwarks have been developed in glass to achieve unobstructed, panoramic views from both the terraces and inside the yacht. A glass atrium, more akin to a greenhouse under pyramid skylights, provides a striking entrance space at the center of the guest area with flying mezzanine bridges linking areas across the foliage. 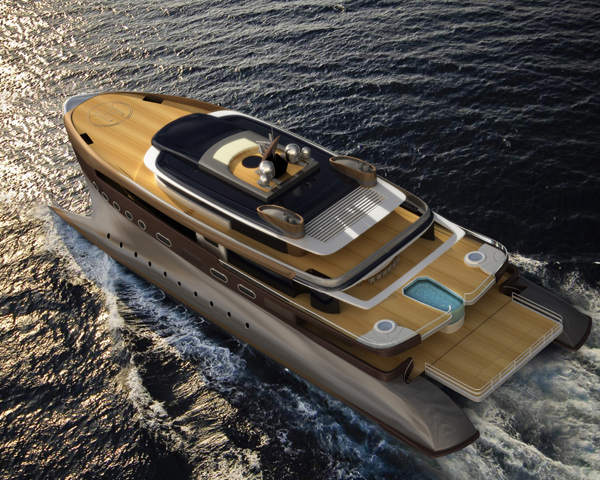 Of course, the extra wide beam also provides a safe and stable platform for a forward helipad, which overcomes the issue associated with monohulls where the wider aft section is commonly used for helicopter operations, even though this is also the key area for guest recreation.